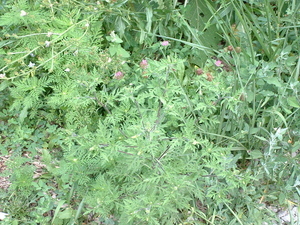 Posted on Mon, Aug 3, 2009 : 5 p.m.
Wildcrafters are generally fans of what other people call weeds. Dandelion, plantain, curly dock, burdock, chickweed; some work to remove them, we are happy to see (and eat) parts of them. But there is a weed now in full glorious and profoundly subtle bloom that can really cause trouble. I've been amazed at the number of "Ragweed Sufferers" who can't identify the plant. Many people have pointed out tall goldenrod while talking about their ragweed allergies. Goldenrod (Solidago canadensis and S. odorais are two helpful varieties) is about to bloom. Goldenrod often is blamed while the small subtle ragweed crouches at its base, silently putting out more and more and even more pollen that is a profound wind-born irritant for so many. 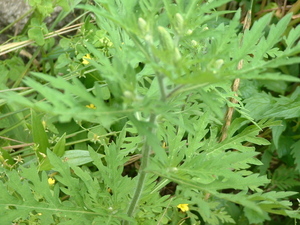 The ragweed flowers are hardly noticeable, but they are followed by a pollen output that is substantial for such a small unnoticed plant. I don't know of any positive use for ragweed, while Goldenrod - which so often takes the blame - is safe to use, and has been helpful to support the immune system, for kidney and urinary problems, for colic and digestive upset, and more. Here is an enthusiastic article suggesting a number of ways goldenrod can be used. If you can, find and remove all of the ragweed in your yard now, before it starts to produce its profuse pollen. If you compost it, it will turn into safe humus. Some people have also reported having a topical reaction to just touching the ragweed plant, so you might want to use gloves. And as you go about your harvesting, celebrate and possibly collect some of the Goldenrod, and steer clear of the ragweed. Goldenrod is harvested for its medicinal uses when it is in full flower, or later in the season the roots are dug and dried or made into a tincture with alcohol. I'll publish more on this plant once it does start to flower. If you click on the photos you can see a larger image that will help you identify the plant. The second photo has a bit of yellow wood sorrel flowers in the background, the last photo has both red clover and some purple echinacea behind it. Don't mistake those flowers for ragweed! 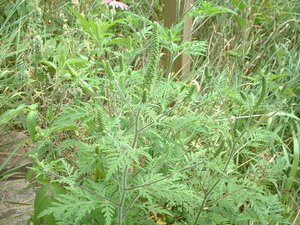 Look for the green narrow cones in the center, and the cut leaves. Follow me "Wildcrafting"on twitter, or check out my website. I've been a holistic health practitioner in Ann Arbor for almost 30 years, seeing clients full time and teaching High School through Graduate School. Tue, Aug 4, 2009 : 5:59 a.m. Thanks so much, Linda. This is so important to know. I really appreciate your articles and knowledge! Mon, Aug 3, 2009 : 9:06 p.m.
Jennifer, It isn't possible to predict. If you're uncertain I'd ask a friend to help out, or hire it done. Next time, try it far earlier, much less likely to have a reaction. Because you may get some pollen at this point. Have someone else pull it, and if no rain is predicted, water your garden before you come back into the area. But maybe someone else will comment with experience and suggestions? I'd err on the side of caution. The allergic reactions can be severe. But I've just observed clients and friends reactions. I am immune so far. Mon, Aug 3, 2009 : 8:52 p.m.
Mon, Aug 3, 2009 : 7:30 p.m.
All of us are quite allergic to ragweed - should we still remove it or might the topical effects hit us hard even with gloves? I'm kind of leery of getting too close to things that cause problems as I can end up with hives.